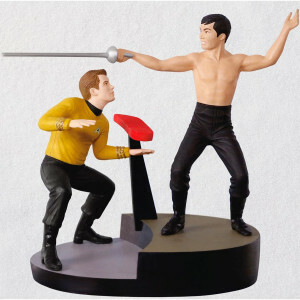 Having succumbed to the planet Psi 2000's intoxication, bare-chested Hikaru Sulu, a swashbuckler at heart, challenges Captain Kirk and other crew members with a fencing foil. This Christmas tree ornament features dialogue from the unforgettable episode "The Naked Time" from the Star Trek™ original television series. Battery-operated sound feature includes two replaceable LR44 batteries. 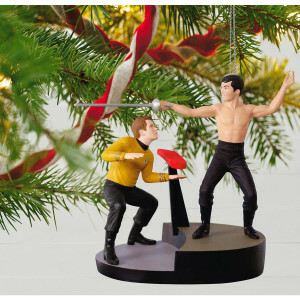 Press the button on the ornament to hear dialogue from this exciting scene. Battery operated. Requires two (2) LR44 batteries, included.